Audio Engineering Associates — better known to most simply as AEA — have built a reputation for making some of the best ribbon mics out there, but their product range doesn't end there, and we've reviewed some fine mic preamps from them, the TRP (/sos/apr07/articles/aear92.htm) and, more recently, the RPQ (/sos/nov09/articles/aearpq.htm). Both preamps were designed primarily to get the best from passive ribbon mics, and thus offer a more than generous amount of clean gain (83dB in the TRP, and 80dB in the RPQ), but of course they're more than capable when used with pretty much any other professional mic. 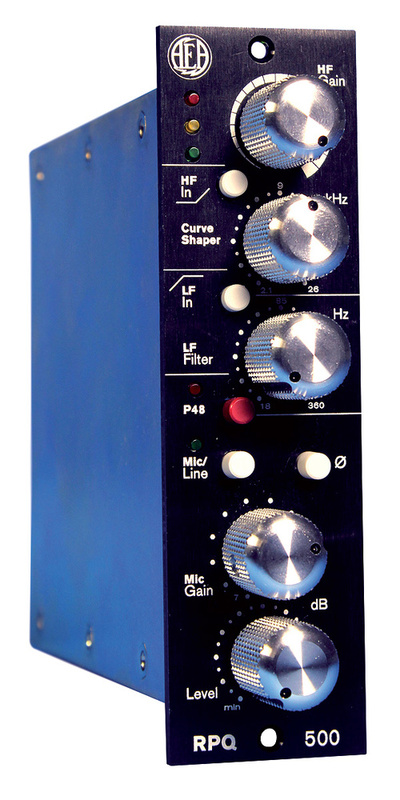 The RPQ, though, is much more than a mic preamp, as it offers true switchable mic/line inputs (not simply a padded signal running through the same circuitry) and, most intriguingly, some very handy EQ facilities, with both a high-pass filter and a high-frequency 'curve-shaper'. The high-pass filter may sound rather humdrum, but it's an essential feature on a ribbon mic preamp: all ribbon mics exhibit proximity effect, and this gives you a means of controlling it before signal capture. The curve-shaper is a high-frequency parametric bell filter, which was created to enable you to draw the top end of a signal up. The frequency response of a passive ribbon mic tends to drop off rather earlier than that of, say, a condenser, but there's still information there if you have the tools to bring it out. Thus, with only these two EQ controls, the RPQ design gives you significant creative control over the sound you capture from any ribbon mic. A handy spin-off of this well thought-out ribbon-preamp design is that, accepting line signals as it does, it can also be used as a processor during the mix stage. For me, the control the curve-shaper gives me over the presence and clarity of a source makes it ideal for this; I've not found a plug-in yet that can do 'air' quite like good hardware. You'll probably have noticed that the product being reviewed here is not actually the RPQ, but rather the RPQ500 module. This is, of course, a spin-off from the original RPQ intended for use in the API 500-series racks. The reason I've been writing about the RPQ is that the circuitry in the RPQ500 is, to all intents and purposes, the same — there's the same mic preamp path, the same mic/line switching, and both the high-pass and curve EQs are also present. What's different is the form factor — and I'm happy to report that the build quality is good, and the front panel easy to understand and to use. Furthermore, like the Cartec Pre-Q5 (probably the closest product in terms of functionality, but rather different in terms of the sonic options) reviewed elsewhere in this issue, this effectively offers two devices in a single module-space, which makes it very convenient. When Hugh Robjohns reviewed the original RPQ, he concluded that "this design just seems to extract the very best from ribbon mics of all kinds, and other dynamic mics too, but it also provides a sublime precision and neutrality for all microphone sources.” His only caveat, albeit slight, was the price — to obtain this quality of preamp, you had to buy the two-channel RPQ. The RPQ500 changes that. I agree wholeheartedly with his verdict on the quality, but you can now buy a single channel for rather less.